I certainly never intended for there to be over a month between blog posts! But sometimes, life happens and that's the way it is. Nothing bad... just busy! 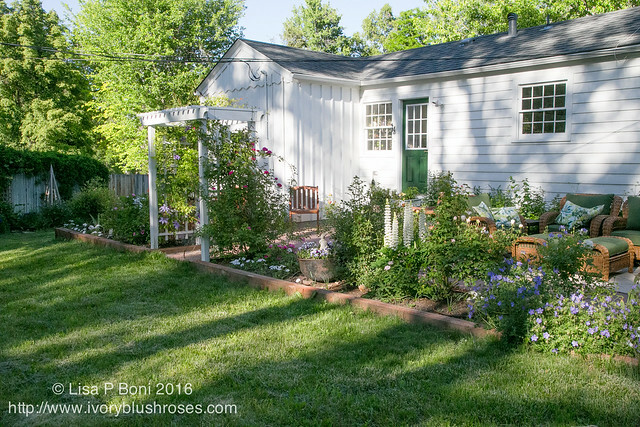 Right now, the garden is doing amazing things! I look out through my kitchen window and am drawn outside to see the latest thing! It seems that every hour, something new is blooming, that the bud that was there an hour ago, has now burst into full beauty! Throughout the day, the light changes. 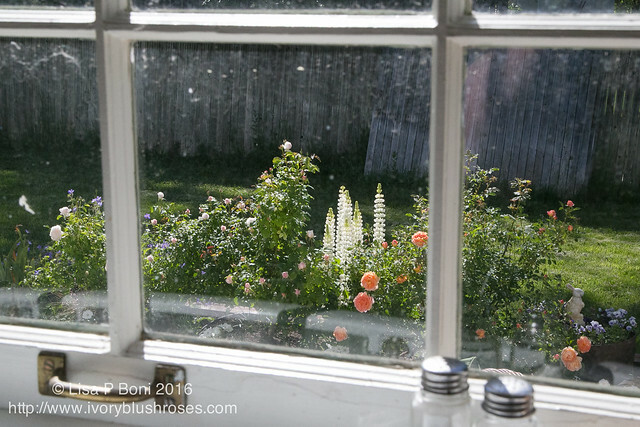 While I love the garden best in the golden glow of evening light, the early morning hours are lovely too, when the sun is just barely kissing it as the rays peek over the roofline of the house. 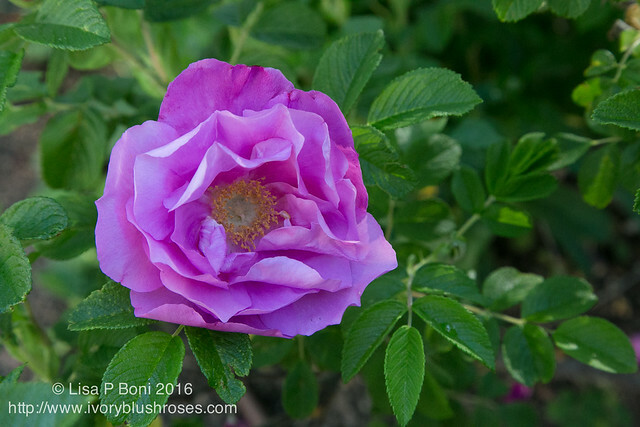 In the morning, the Rugosa Roses are all a bit wilty looking. 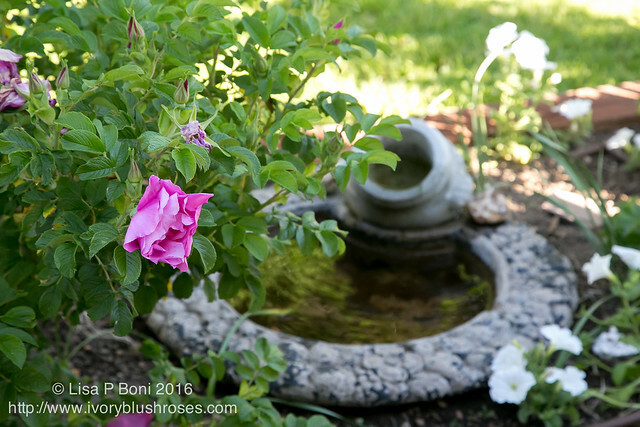 Brushing against the older blossoms causes the petals to drop into the birdbath. 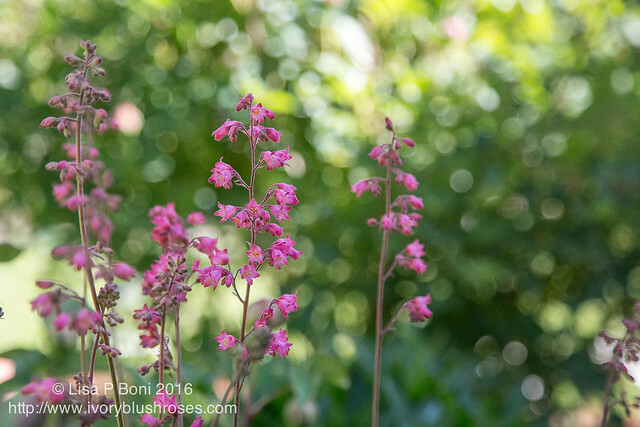 The coral bells lift delicate stalks of pink blossoms into the air. My Mom had one that would only send a couple of stalks at a time, but this one that I have must have twenty stems raising loftily into the air right now! So beautiful! The stately lupines glow in the morning sun. They were a favorite of my Dad, who loved flowers that grew in spires. 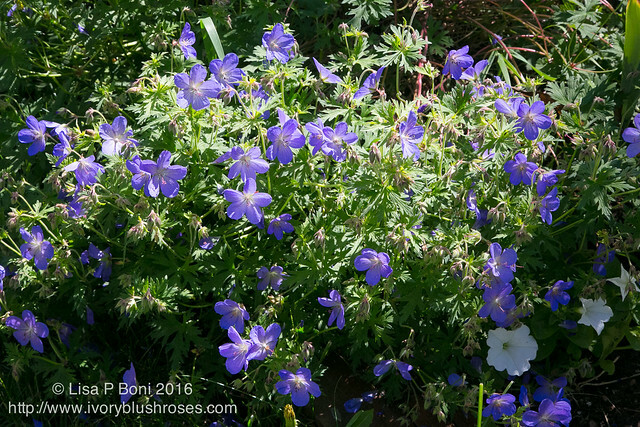 At the end of the Arbor bed, the perennial geranium is blooming like mad. This is one of the plants that we saved from an old overgrown bed along the fence that we dismantled. I'm so glad it is able to live on in a new spot! 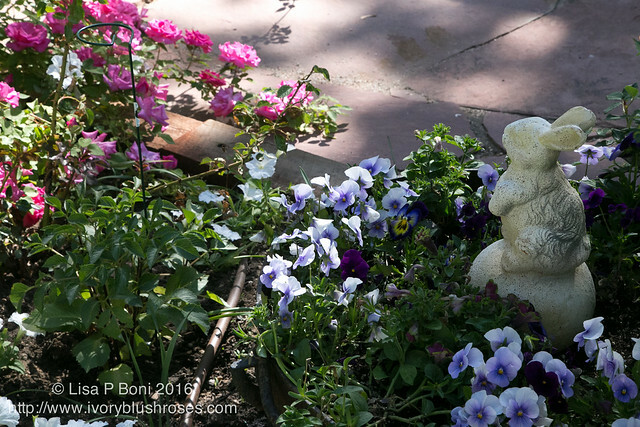 The old iron cauldron from my mother is abloom with pansies that I planted last fall. I added a few new ones earlier this spring and topped it off with some petunias just last week. 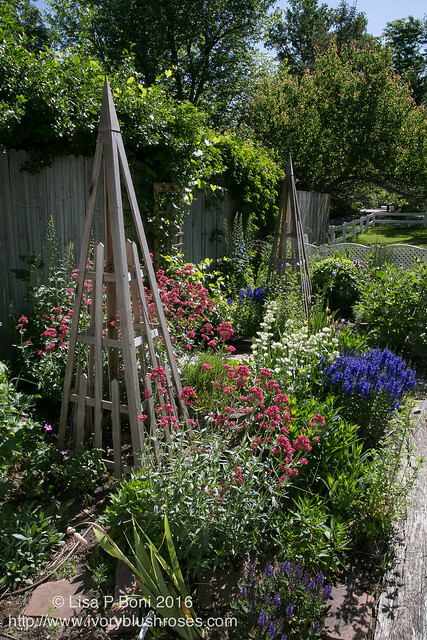 Looking along the Arbor Beds to the Side Gardens is a lovely sight! Just amazing how everything has burst into bloom at once this year! 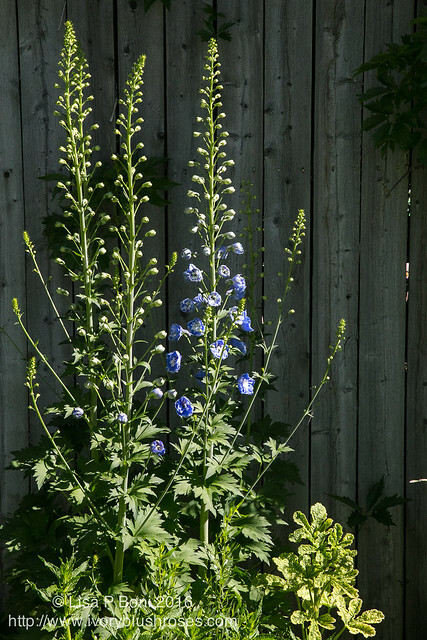 In the side gardens, the delphinium are just barely beginning to blossom! From the numbers of stalks, they must be happy! Can't wait to see them all in full bloom! The hollyhocks are also coming along nicely and should begin blooming before the delphinium finish! Right now, it all looks so lush and amazing! Hard to believe that my little gardens are only 3 years old! I'm so grateful for all the plants from friends and family that have helped them into being! 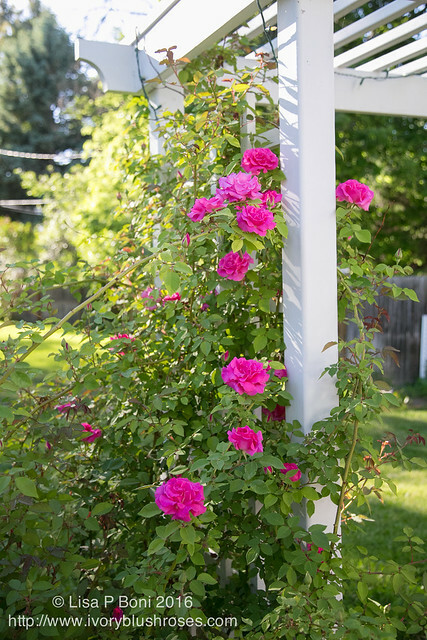 On the arbor, the Zepherine Drouhan rose is just beginning to bloom! Last year there were just a handful of blossoms, but this year, it is covered in buds! I love this one, not only for the brilliant color, but also for the nearly thornless canes! It makes it so easy to take care of! 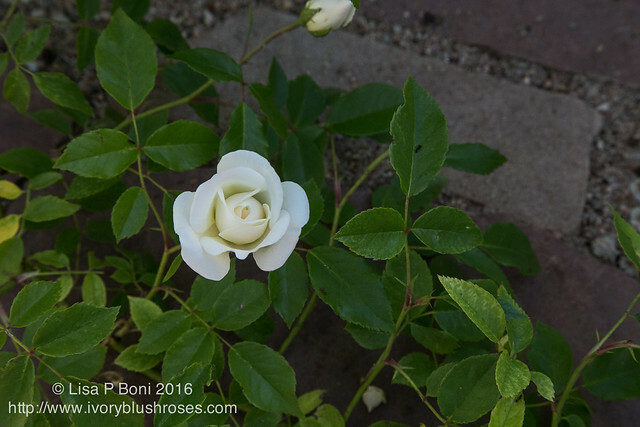 On the opposite side of the arbor, the Iceberg climbing rose is also just barely starting to bloom. In the two years it's been there, there hadn't been a single blossom. Not one. This spring I gave it a talking to, and let it know that if it didn't bloom this year, it was history. It must have listened as this year, there are a fair amount of blossoms. 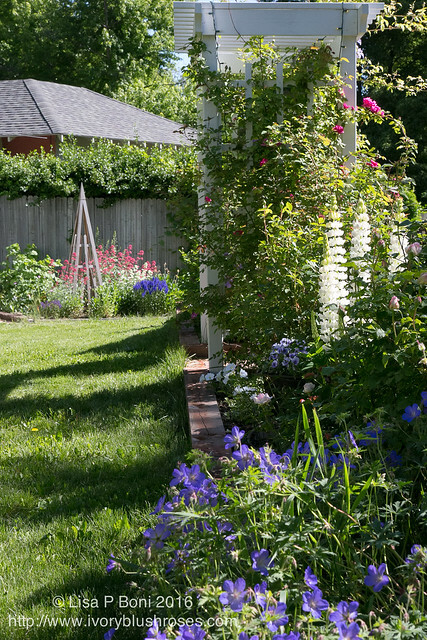 Can't wait to see them in bloom with the lovely clematis that also grows on that side of the arbor! By evening, the whole tone of the garden changes. The light is warmer and everything seems to have a glow about it. 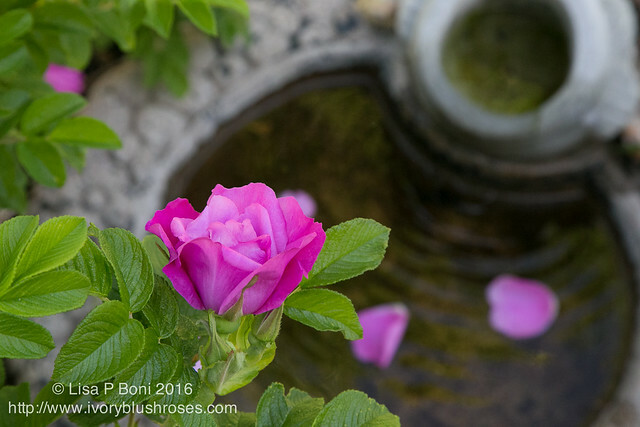 The rugosa roses have opened out with the warmth of the day, showing their frilly yellow centers. They look like big tissue paper roses to me! Later on, they'll have huge orange rose hips the size of small apples! There are enough blossoms this year, that I might consider making rose hip jelly at some point! 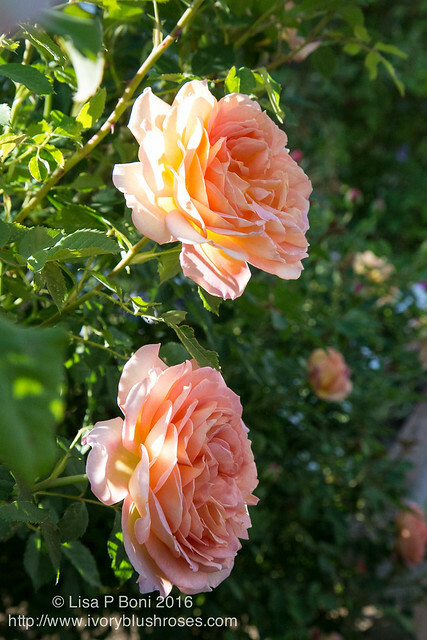 The Lady of Shallot Rose (a David Austin English Rose) is in full glorious bloom already! Last year it bloomed nonstop from June until mid November. You may remember that orange is my least favorite color. Most of the time, I really despise orange. But these blossoms, tinged with yellow and rose to soften all that orange, are so glorious, that they almost make me change my mind! As the sun dips low in the sky, it makes the lupine spires glow. 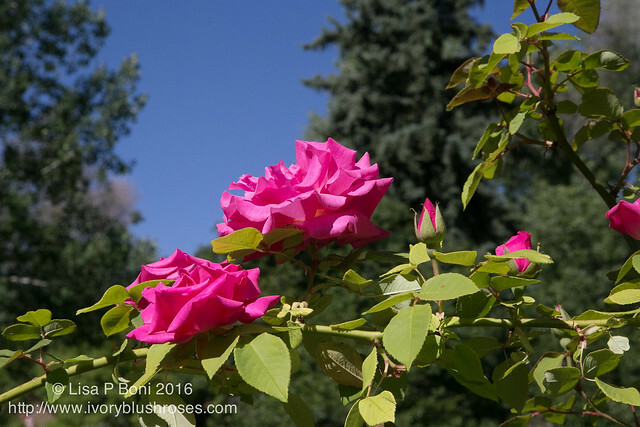 What a backdrop it makes for a beautiful rose! 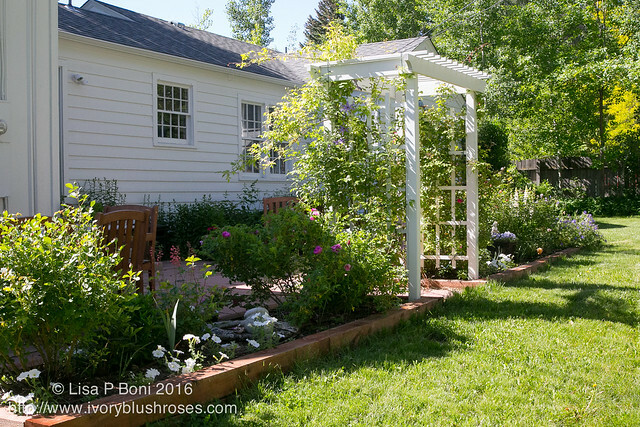 Every hour, another bunch of blossoms opens up on the arbor until it is covered with sprays of brilliant blossoms! For as many as are open, there are at least just as many more still to come and I cannot wait to see it in all it's glory! Truly a bit of heaven, here on earth! This past month was a bit of a whirl! 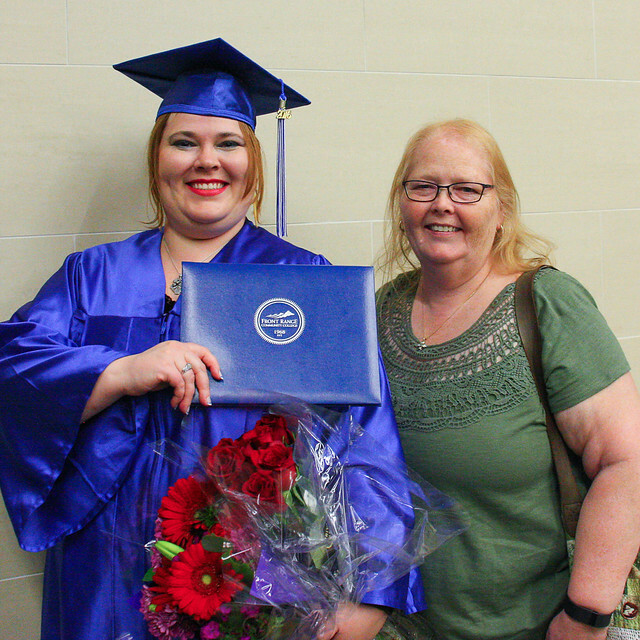 It started off with my daughter Jessie's graduation from Front Range Community College. She has worked long and hard for this! So wonderful to see her achieve it! Then my sister arrived and we headed off to South Dakota to see my Dad's side of the family. 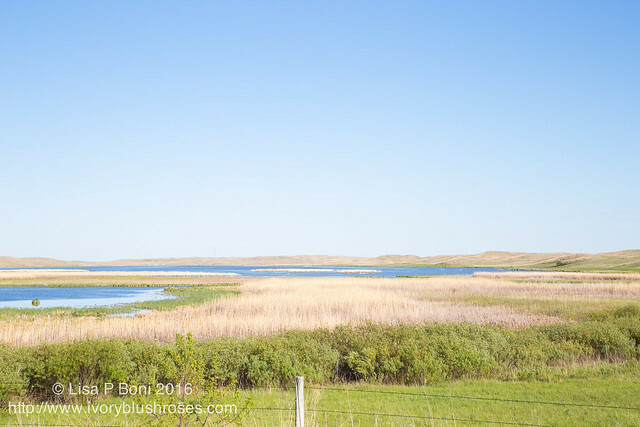 Across the plains of eastern Colorado and western Nebraska and then up through the Sandhills of northern Nebraska. As a child, the trip was long, hot, and seemingly took forever to get through them. Just endless rolling dry hills with herds of cattle here and there. Now that I have a greater appreciation for wide open spaces and the treasures to be found everywhere, it's one of my favorite parts of the journey north. I love how in the bottom areas, there are sapphire blue lakes to be found, surrounded by the dry sandy hills. Veritable oasis for so many birds! 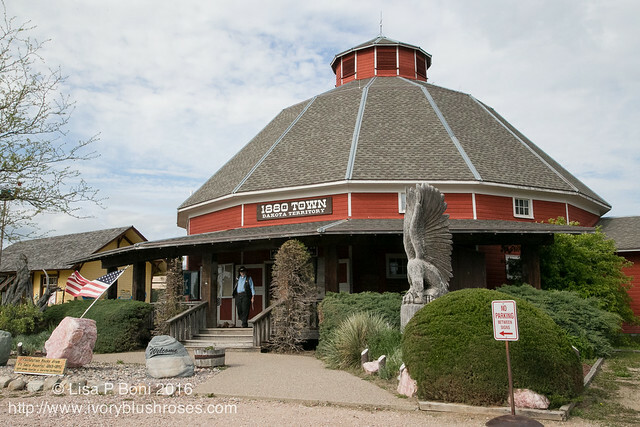 We stopped at the Valentine National Wildlife Refuge to birdwatch and saw so many things new to both of us! 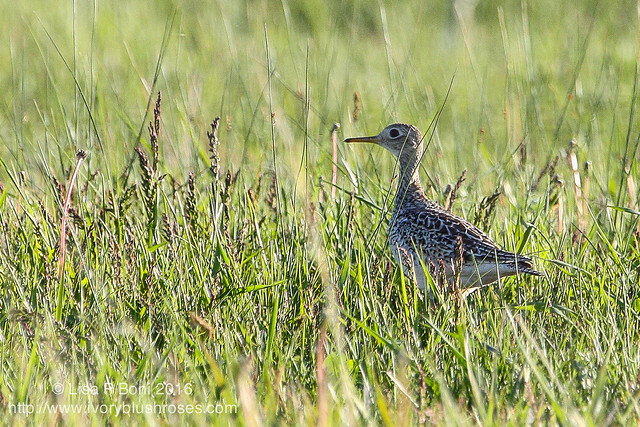 In particular, the Upland Sandpipers were a delight to see! We also watched a nesting pair of Trumpeter Swans! 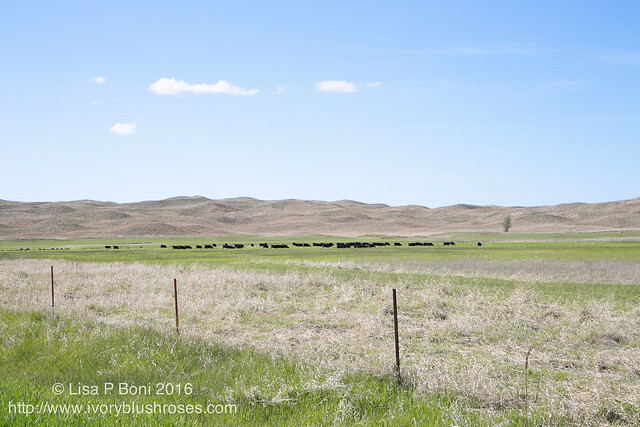 Then our journey took us across south central South Dakota, the land of our ancestors. 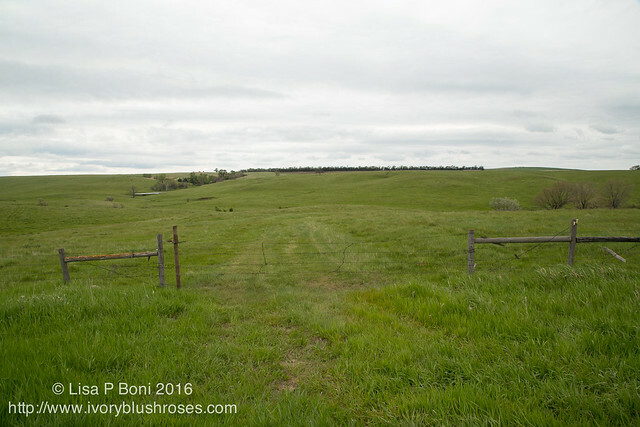 We found the spot near the Missouri River where our great, great grandparents homesteaded, just over the hill to the right in this photo. Forty years ago, the old home still stood, though in sad and decaying shape. Now, it is just an open field, lush with grass and so many more trees than were here in those long forgotten days past. From this spot, our GG Grandparents ran a Post Office and Store and it was known as Nieveen, SD. There were hundreds of people in the area. Today it is a lonely quiet spot with just the wind and the birds for company. 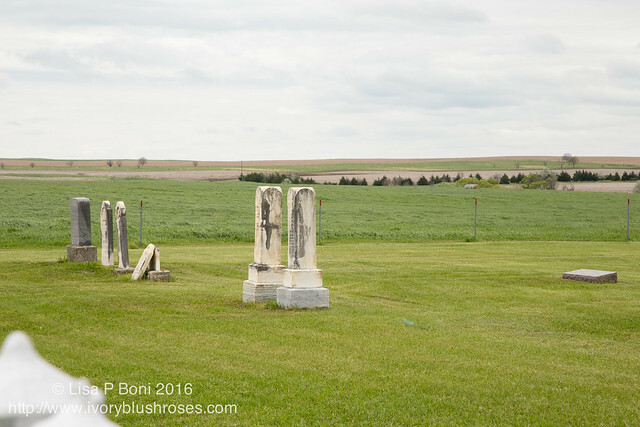 We made a stop not far from the homestead site to see the old cemetery. It's a spot I've always loved, sitting a little bit higher than all the surrounding country. Two sets of Great Great Grandparents lie buried here along with other more distant relations. While we visited the site, another family arrived, also from several states away, to visit their own set of great great grandparents. After making other stops along the way to see some of the other places our family lived, places from our memories, we eventually arrived in Sioux Falls where my Aunt & Uncle and cousins live now. 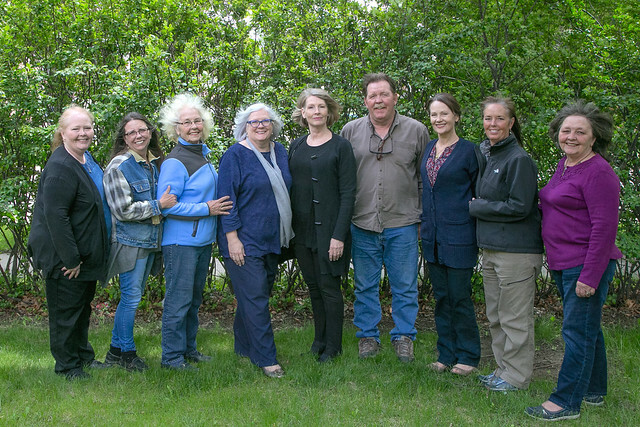 another contingent of cousins arrived from Des Moines and for the first time in nearly 40 years, all the cousins of our generation were gathered together along with Aunt Mary! A neighbor kindly took our photo on a blustery day! 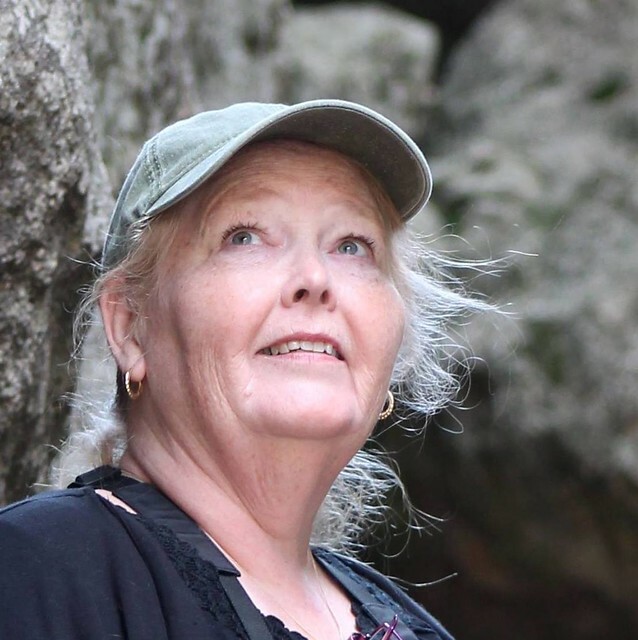 I loved how the wind gave my Aunt Mary a halo! 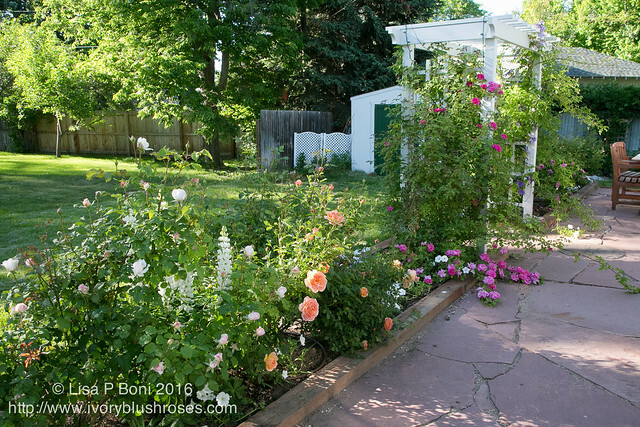 Cousin Jackie's yard was beautiful and in glorious bloom! 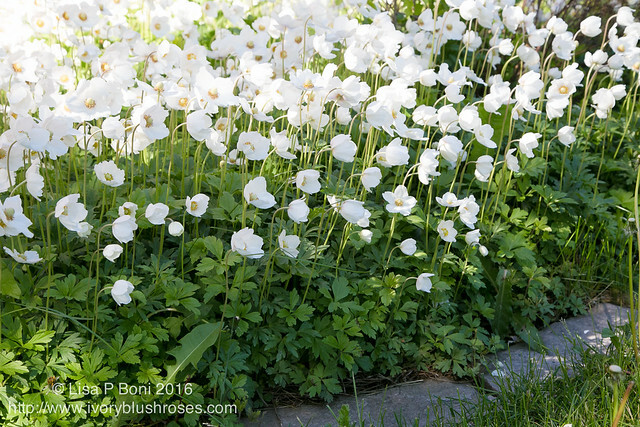 The white anemones surrounded her house and Holly and I both fell in love with them. Jackie blessed us with starts from them, which we both brought home and promptly planted! Can't wait to see how they do along my front walk! I hope they look half so glorious as these! 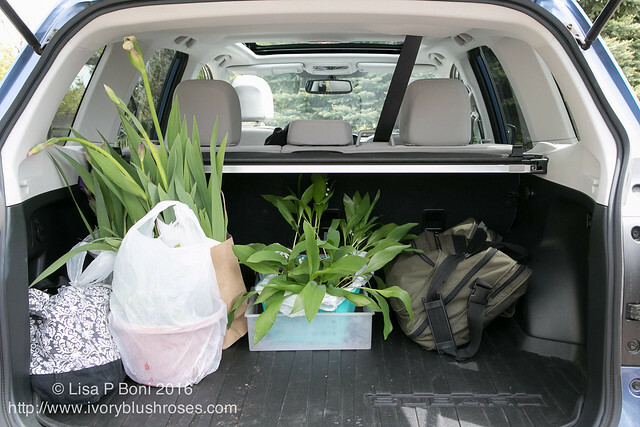 We also came home with other plant treasures ~ iris from both our grandmother and from our Aunt Olive, both of whom had extraordinarily beautiful gardens ~ not an easy task on the dry South Dakota prairies. What a joy to be able to add these living memories to our own gardens! After three lovely days with family in Sioux Falls, we made our way across the state towards Rapid City and more family! Along the way, we stopped at the 1880's Town Museum to see a couple of my Aunt Olive's paintings that were hung there. 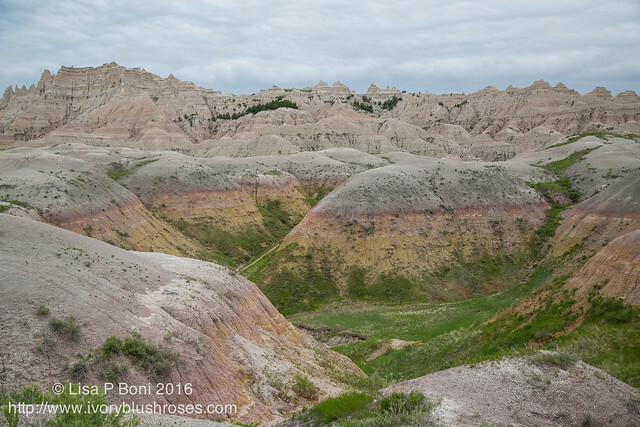 Then it was on through the Badlands. 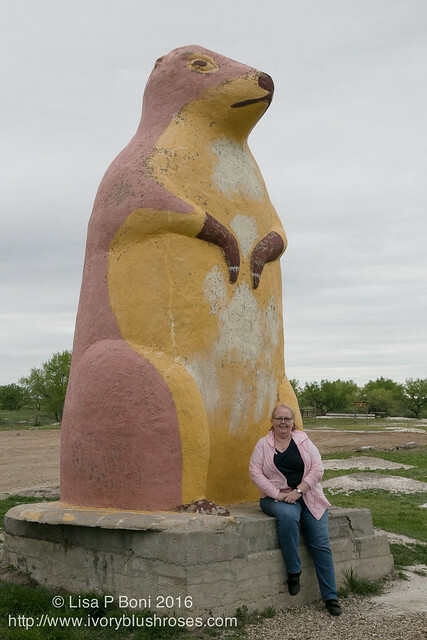 We had to stop and take our pictures with the giant prairie dog! 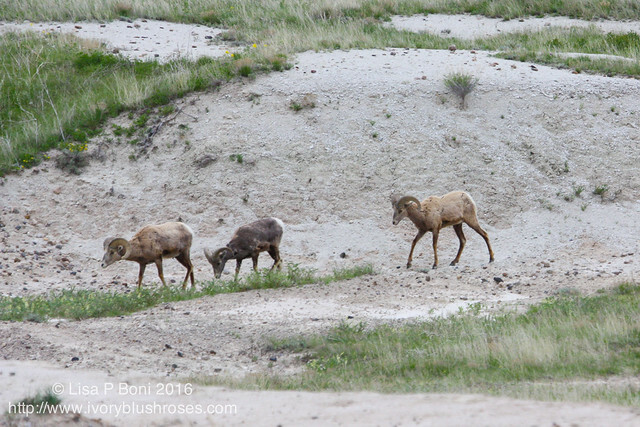 We hadn't gone very far before discoing a herd of Bighorn Sheep! Always a delight to see such critters and such a surprise to see them there! 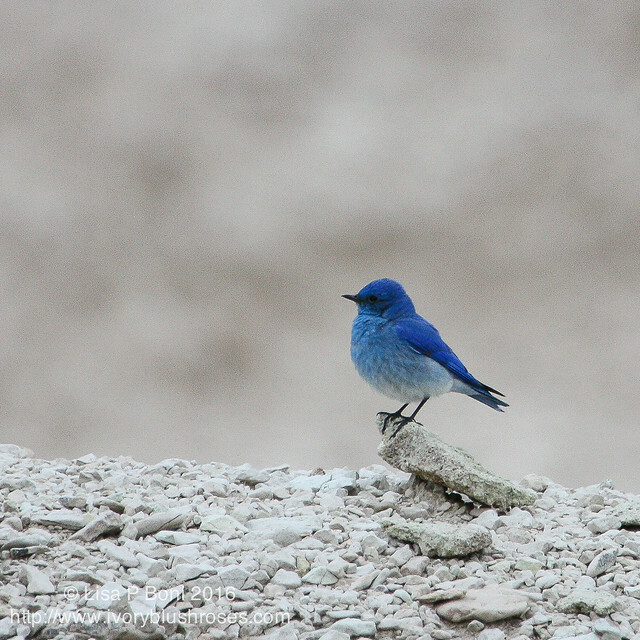 At one spot, we stopped to watch the Mountain Bluebirds! So incredibly beautiful and ever so blue! The vistas were magnificent, even on a cloudy evening. We spent a day with my Uncle David and Aunt Bonnie. 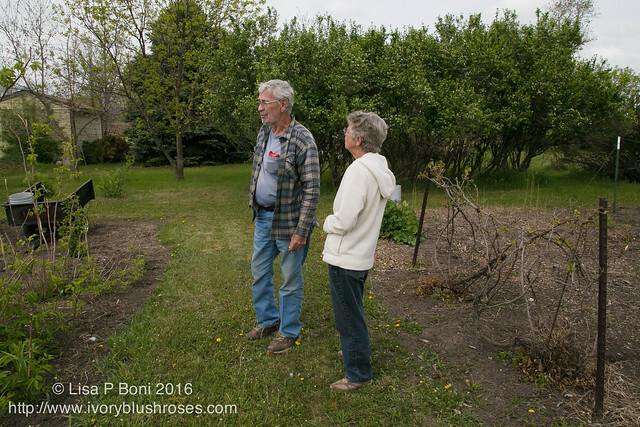 Loved seeing their enormous garden, getting to know their sweet kitty, and mostly just spending time with them! 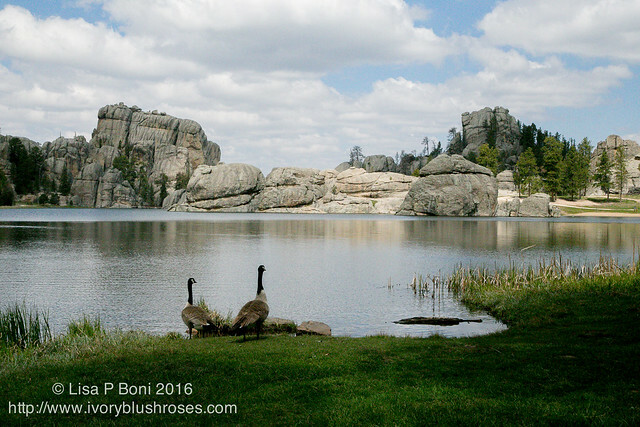 On our way home, we drove through Custer State Park and walked around Sylvan Lake. So beautiful! Back in the late 70's, I spent a summer working in the Black Hills at a cabins & campground that was just across the mountain from Sylvan Lake. Despite being so close, I never actually took the time walk around it back then, so it was a delight to do so now with my sister! My sister took this photo of me while we were there! And then it was home again. It was a delightful week spent with my sister and with so many dear ones of our family. Now, after a couple of busy weeks at work filled with extra shifts and meetings, I've had a few days at home. There hasn't been much stitching happening, though I did complete a couple of different projects early in May, which you'll be able to see in the Winter and Christmas issues of Pam Kellogg's Crazy Quilt Quarterly Magazine. Who could resist this face? 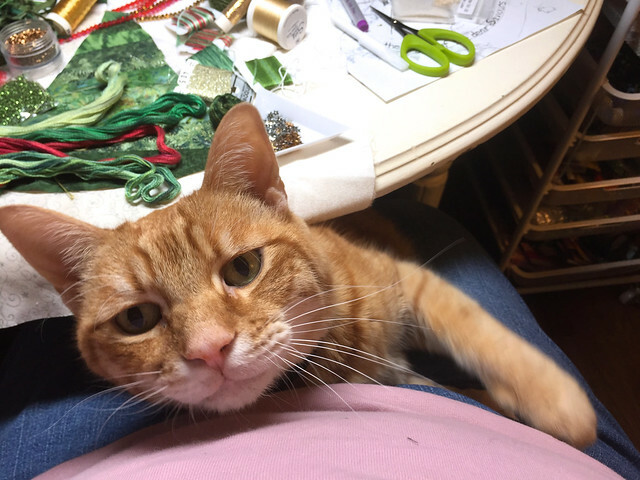 Thomas Kitty makes it hard to focus on stitching sometimes! Instead I've been busy with projects around the house and garden. 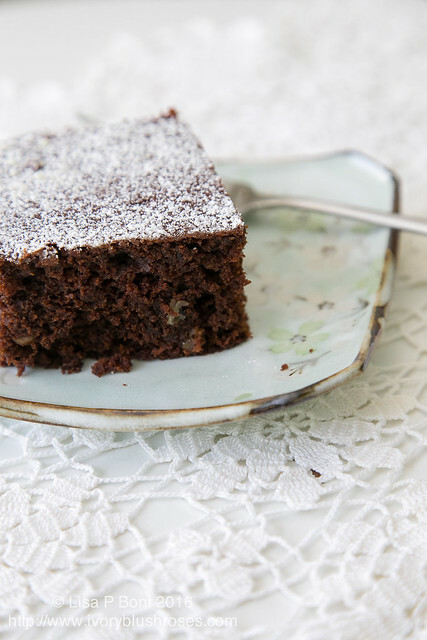 Namely working on our family cookbook, which then leads to making various things so I can take photos for the cookbook! 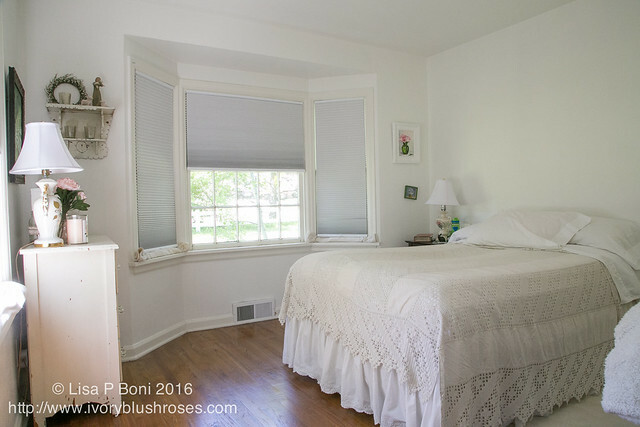 of light that seeps in around the edges of the room darkening shades so that I can sleep better during the day. I am so happy with how this room has come together and I love how open and calm it feels! One last photo from the garden to leave you with! 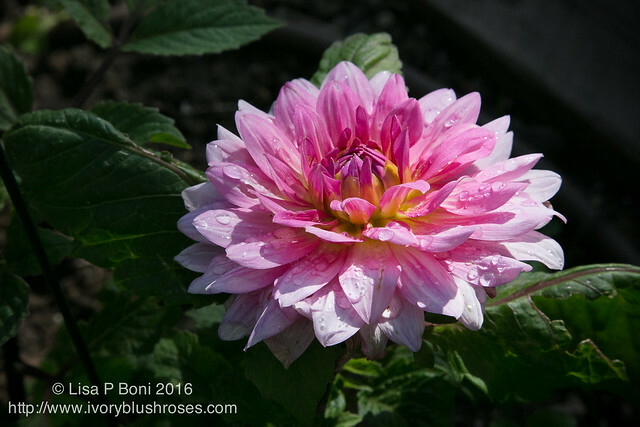 One of the lovely Dahlia's, which I potted up a couple of months ago, is already blooming! Love being in the garden! It's where I'm spending most of my free time right now! 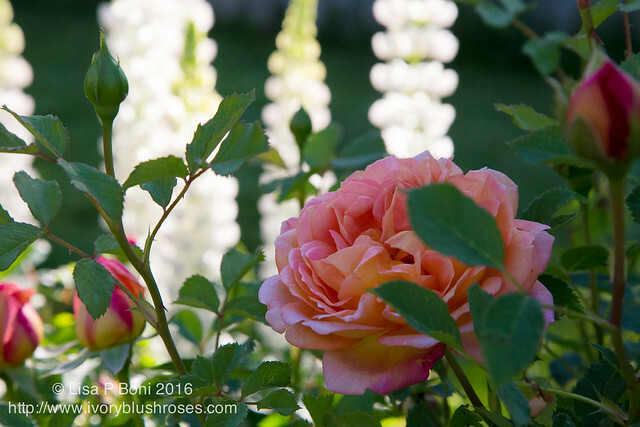 You are blessed to have such a garden.Thanks for sharing photos of your trip, beautiful. Oh, I do love your garden. 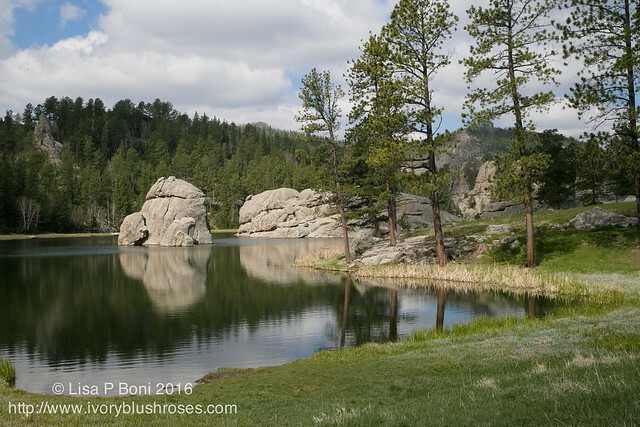 Enjoyed the trip review and the photos of South Dakota. I, like you, have changed my opinion of the Dakotas, When I was young, I thought it was best viewed in my rear view mirror, but now I appreciate its spartan and windblown silence. Walking through hip high prairie grasses, listening to the chorus of nature is awesome in the true sense of the word. What a great post, filled with a little bit of this and that. I thoroughly enjoyed it. Love the photo your sister captured of you. Your gardens are filled with so much beauty. Your bedroom is lovely and serene. Your feline companion oh so hugable. My goodness - it's no wonder you haven't been able to find time to blog! 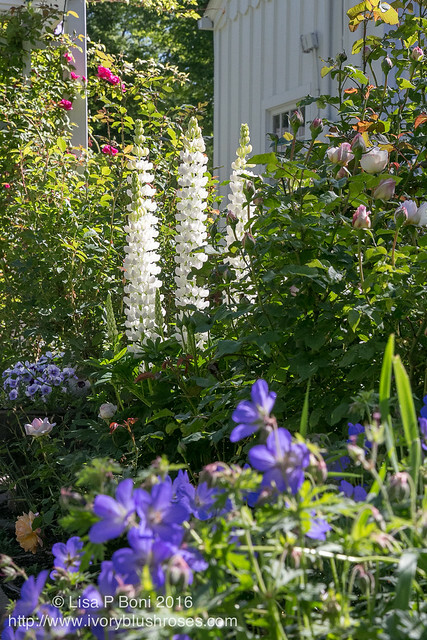 So many wonderful things to see, both in your garden and on your trip. Your flowers are so beautiful and makes me long for a garden again - not enough to move back into a house though! Wow! Thomas and Bible quotes, could a blog be more perfect. Oops, think I put those in the wrong order, lol. I have been wandering through pinterest saving crazy quilt treatments to try and always your name/website come up. I just love your style and looking a all your gorgeous flower and nature pictures makes me realize where your inspiration comes from. Just wanted to acknowledge my joy in your work.